The City of Cleveland is proud to announce an incredible partnership to bring a new grocery store to east side residents. 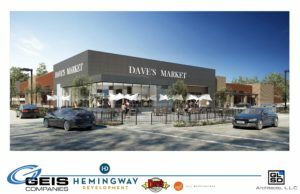 In partnership with Hemingway Development, Dave’s Supermarket will be constructing a brand new grocery store located at the corner of E 61st and Chester Avenue. Hemingway Development has spent the past several years redeveloping formerly vacant and underutilized sites in the Health-Tech Corridor of the MidTown neighborhood in Cleveland. In partnership with Dave’s Supermarkets, the two companies are working together to bring this fresh food grocer to a strategic location in the Health-Tech Corridor. Dave’s Supermarkets is a family-owned and operated supermarket chain founded in 1932 in the City of Cleveland. With 14 locations in Northeast Ohio, eight of which are located in the City of Cleveland, the company is one of a few long-standing grocers in the City of Cleveland who continues to provide residents with access to fresh, healthy and affordable foods. This 60,000 SF new construction supermarket will be part of Hemingway Development’s Link59 campus. The one-story building will include approximately 50,000 square feet for the grocery store and approximately 10,000 square feet of mezzanine space for a pharmacy, bank, and neighborhood gathering space. Across the street from University Hospitals’ new Rainbow Center for Women and Children and directly on the HealthLine, the grocery store will provide residents access to fresh, healthy and affordable food. The total development cost for the project is approximately $16.7 million. The City provided multiple incentives including a 10 year 75% Tax Abatement for the new grocery store location. The project estimates the retention of 115 full time equivalent jobs in the City of Cleveland. The addition of Dave’s Supermarkets to the total Link 59 campus and the Health-Tech Corridor will continue to build upon the revitalization, job creation and increased economic activity along the Health-Tech Corridor. Locating along the HealthLine in the Health-Tech Corridor provides the communities surrounding the HealthLine a full-service grocery store at an easily accessible location. This close proximity builds off the success of the transit-oriented development, leveraging our existing transportation infrastructure to confront issues of food insecurity. As one of the few grocery store chains within the City of Cleveland, Dave’s Supermarkets is an important asset to the community. The project’s feasibility is a priority of the City of Cleveland in order to promote access to fresh and healthy food for community residents.